Trying to sell your home FSBO in NYC can be a nightmare. After you list on Zillow you can expect to be inundated with hundreds of broker cold calls asking you to pay the typical 6% commission and list with their “differentiated” approach. You may also face the prospect of brokers bringing in “bids” from “clients” who are none other than their friends in an effort to frustrate you enough to give up. Like most NYC homeowners, you don’t want to pay the average $120,000 (6% x $2 million average home value) in broker fees but you are also too busy with work to spend the many hours required to figure out how to sell your home. We’ll show you in this article 5 simple steps you can take to successfully sell FSBO in NYC. Even if you have a co-op apartment, we’ll show you that selling a coop is something that you can entirely handle on your own! Can I Pay Less Than 6% Commission for a Real Estate Agent to Sell My Home? One of the most important things you can do is to price your home correctly. Price per square foot is one of the most important metrics buyers will use to compare your home vs. other offerings on the market. When evaluating your home’s offer level, buyers will check the previous sales history of your home and also look at comparable home sales in your area. It is especially important to make sure your home price is reasonable if there are other directly competing listings in your building. Because real estate is so illiquid, buyers will often take the percentage return from the last sale price to the current offer price to see if your return yearly is reasonable. There are a variety of resources and useful real estate websites an individual like yourself can use to gauge what your offer level should be. These include the free comparative analysis reports on websites such as StreetEasy. You can even take a look at what Zillow says your home is worth, though keep in mind it is a computer generated figure. You may want to consider hiring a professional real estate appraiser, one just like your banks would use, to give you the benefit of both your appraised value that a bank would lend against and also an estimate of your current market value. Keep in mind you may need to price your property lower than competing for sale by agent listings if you are selling FSBO in NYC with incomplete buyer exposure. As we’ll discuss later in this article, that’s because over 90% of all home buyers are represented by buyers’ agents in NYC. If your home is missing the attention of most home buyers, wouldn’t it make sense that your home will sell for less? Alienating buyers’ agents is often the first thing traditional FSBO in NYC home sellers do. They’ll write “no brokers” or “principals only” on their free Zillow listing and expect their home to sell in a week. This is one of the top 3 reasons traditional FSBO sellers fail. 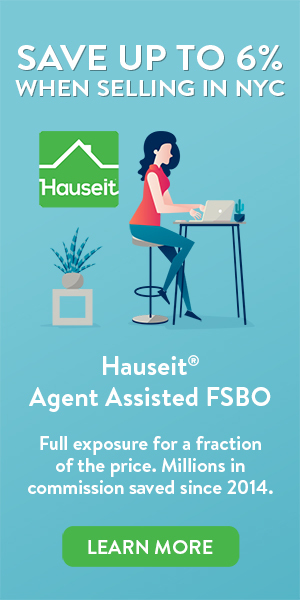 A key advantage to selling your home through an Agent Assisted FSBO is the ability to engage all home buyers yet also under-price your home versus comparative homes on the market. Unlike traditional Exclusive Right To Sell Listing Agreements where the home owner is obligated to pay 6% in commission as long as a “ready, willing and able” buyer is found at her listing price, an Agent Assisted FSBO home seller owes no further commission to her listing agent and is free to do as she pleases. She can choose to sell to an unrepresented buyer and pay zero commission or she can choose to sell to a buyer represented by an agent and pay the commission she has offered in RLS (NYC’s Multiple Listing Service). Furthermore, she can choose to do absolutely nothing at all even if a buyer submits an offer at her listing price. She can choose to do nothing and cancel her listing agreement at any time without penalty! Great photographs that present your home in the best possible light is one of the most important factors in successfully selling FSBO in NYC. Photos are the first thing buyers see and great photos help a buyer imagine a new life in your apartment. Not only will a photographer bring professional grade equipment such as wide angle lens, he or she will also have experience on what angles and lighting situations work best to show off your home. After the photo shoot, photographers can make flattering enhancements to their photos via PhotoShop and other popular photo editing tools. We offer reasonably priced, flat-fee professional photography so you can be sure to represent your home to buyers in the best possible light. Don’t take a chance with DIY unprofessional smartphone photography with questionable lighting and quality! It will scare away real buyers and attract the vulture type of buyer who preys on unprofessional FSBO listings thinking that they are mis-priced and poorly marketed! Learn more by reading our comprehensive article on the benefits of using professional photography when marketing your home for sale in NYC. One of the biggest mistakes sellers make when they try to sell FSBO in NYC is not being comprehensive in their advertising. They advertise on only one or two websites and assume that is enough. No matter how popular Zillow is, listing FSBO on Zillow only will mean only a subset of buyers will see your home. The fact of the matter is, there are literally hundreds of competing consumer search websites out there that all capture a fraction of the buyer market. On top of that, international buyers will typically rely exclusively on a local buyer’s agent who will definitely browse co-broked listings through their local inter-brokerage database. As a result, the only sensible solution is a listing syndication service that posts your home on all websites and databases at once. You could try to find a free consumer listing syndication service; however, these services are typically a scam and marketed simultaneously to agents as a great place to poach FSBO sellers and find off market listings! These supposedly free FSBO listing syndication services will only list your home to several free nationally focused real estate search websites and not to any of the broker databases which are, you guessed it, broker only. Moreover, a free syndication service won’t list your home on popular NYC focused real estate search websites like StreetEasy, The New York Times and Brownstoner which are not free. Fortunately, Hauseit will pair you with a brand name REBNY Member Firm who will post your listing all at once dozens of popular real estate search websites and all relevant inter-broker databases (i.e. RLS and RLS vendors such as OLR, Nestio, RealPlus and RealtyMX as well as brokerage specific databases). Best of all, you’ll pay only a low, one-time fee of several hundred dollars vs. the traditional 6% sales commission. Most people don’t realize that 75-90% of all home buyers are in fact represented by real estate agents. How is this possible in the age of the internet? The fact is real estate commissions are extremely lucrative, a home purchase or sale is a big enough decision for most people where in-person sales is effective, and there are so many “boots on the ground” in terms of agents advertising everywhere that buyer representation is free. Because of this, many buyers will not hesitate to use an agent to help them with their home search, especially if they are new to an area or would like help organizing a weekend open house tour. Most buyers do not realize that their agents will typically only show them listings by other agents. The reason they do this is because the tradition of co-broking, or splitting of commissions all paid by the seller which typically range from 5-6%, is so established between agents that buyers’ brokers will feel comfortable that they will actually be paid for bringing a buyer. This is the reason so few who sell FSBO in NYC actually succeed. They either say “no brokers please” in which case they’ll remove up to 90% of potential buyers from the pool, or they’ll write “will work with buyers’ agents” or even “will pay 3% to buyers’ brokers” in their FSBO listing. In the latter case, even when FSBO sellers explicitly offer 3% to buyers’ agents in writing on their traditional FSBO listing, it is an uphill battle because the FSBO seller is an unknown individual with no history of co-broking. A buyer’s agent will instinctively prefer a traditionally co-broked listing by another agent instead of a FSBO listing where they have to worry about the seller going around them or not honoring the commission. For this reason it’s extremely important to engage a company like Hauseit who will list you not only on dozens of popular websites but also on all the relevant inter-broker databases under a local, brand name, traditional listing agent. NYC is unique in that having a real estate attorney to represent you in contract negotiation, due diligence and closing is essential vs optional in some other states. In NYC the real estate agent’s role is confined to matching buyer and seller at a mutually agreed upon price. After a buyer’s offer has been selected, the agent is out of the equation and the attorney takes the transaction the rest of the way. This is in stark contrast to other states like California where the purchase and sales forms are highly standardized and the real estate agent typically takes their client through the paperwork and an attorney is usually never hired. The first thing the sellers’ attorney would do is send out the purchase and sale contract to the buyer, usually with a criteria that they must sign it within a certain number of days before it’s automatically retracted. As a buyer, your attorney will play a critical part in negotiating the contract on your behalf. If you are purchasing with a mortgage, it is extremely important that you go over the mortgage contingency aspect of the contract with your attorney. As a FSBO seller in NYC, it is even more important to make sure you have a good attorney at your back. They have typically experienced a great number of real estate transactions in their careers and will typically know far more about how a real estate deal is closed than your typical licensed real estate salesperson. Learn more by reading our article on questions to ask your real estate attorney during an interview before you hire them! The common sense steps in this article for selling your home FSBO in NYC are great and can save most home owners a substantial amount of money. However, many New Yorkers are busy full-time working professionals. Can someone just do everything for them but for less than 6% commission? Fortunately, Hauseit offers a full-service for 1% commission listing option to home owners who are too busy to sell by themselves. We will pair you up immediately upon signing up with a full-service, brand name, traditional REBNY Member Firm with a great ratings and reviews. Will other brokers be able to tell that you’re not paying full commission? Absolutely not. Openly discounting commissions has been proven to not work over the decades as it builds resentment from other brokers whom our affiliates need to work with to close deals. Our affiliate brokers do not advertise that they take discounted listings because they want to preserve their full-service reputations. The fact that you’re not paying a full six percent in commissions will be our little secret!